Have guitar, will travel...and hopefully with an amp as nice as this one. These are some incredibly stylish amps made by Carr Amplifiers that range in price from $1150-$3350. The founder, Steve Carr, in Pittsboro, North Carolina wanted to create amps that are as functional as they are inspirational. As stated on their site, "Discerning guitarists continue to enthusiastically embrace the tone, reliability, and versatile nature of our amplifiers. Perhaps it's because we view guitar amps as being as much an instrument as the guitar itself, and we truly believe that an amplifier should become a personal extension of every player." 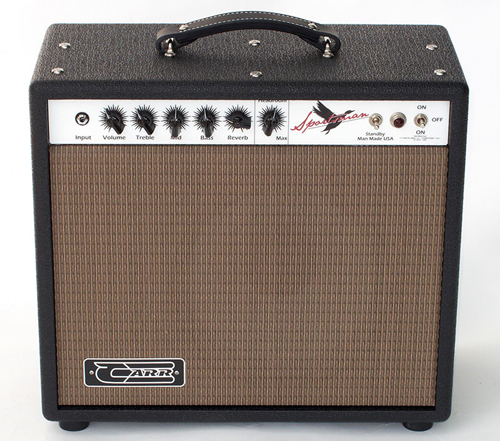 As I'm sadly not musically inclined, I can't tell you the key differences between one amp and another. But I can tell you, the Carr amp is revered for its high quality components, thoughtful design and as I've read time and time again, their incredible tone and versatility. Plus, they look good. Learn more about Carr here.